Alison Brimelow, president of the European Patent Office, has referred the deeply contentious question about how to assess the patentability of software-related inventions to her office’s top appeals body, the enlarged board of appeal (EBoA), the EPO said late Friday. On the same day the U.K. Court of Appeal threw out a challenge against a patent owned by IT company Aerotel for a computer program that created a new network infrastructure for a group of computers. The three judges presiding over the cases considered the first a business method, and therefore unpatentable, while the second was seen as a patentable hardware change. Another U.K. judge called for a referral to the EPO’s top appeals body to clarify the law concerning software patentability. 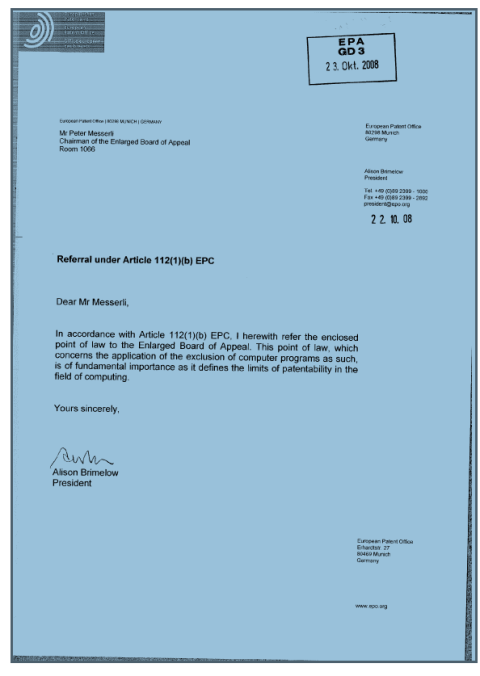 Referral to the enlarged board of appeal (EBoA) is something that FFII supported and it can be found in their Web site. There is also a page done by the Bio-activists of Greenpeace which explains what they did when the issue of life patents went to the EBoA. For context relating to this example, here is an old press release. Say No To Patents On Life! New Delhi 30 January 2004: Greenpeace activists today confronted Mr. Stephano Gatto, Counselor, Trade and Economic Affairs European Commission and briefed him about Monsanto’s role in blatant bio-piracy of Indian wheat. The activists demanded that the European Union ban patenting of seeds and close all loopholes in the existing law that is abused by multinational agro-science companies to patent plants, animals as well as their genetic resources. “It is imperative that Europe Union takes an uncompromising stand against monopolies on seeds and not allow multinationals like Monsanto to appropriate biological diversity of the south with back-door patenting,” said Dr. Ashesh Tayal, Scientific Advisor, Greenpeace India. Greenpeace had filed legal opposition against Monsanto’s patent on a variety of Indian wheat at the European Patents Office (EPO) in Munich on 27th January. Greenpeace investigations of the patent reveal that it is incorrectly recorded as an invention while there is evidence that Indian farmers have bred, cultivated and processed wheat for baking purposes long before Monsanto filed its patent. Greenpeace has been mobilizing farmers and consumers community around the world with a post-card campaign targeting Monsanto and Indian Government demanding revoking of the wheat patent. Greenpeace has also been holding round-tables with Farmers groups to counter the threat to Indian bio-diversity from Multinational corporations. “We definitely expect the wheat patent to be revoked in total. Further steps have to follow. Earlier Monsanto had taken a patent where they claimed even the use of the flour to make chapatis. These patents shows that companies systematically are trying to convert patent law to an instrument to gain control over all aspects of agriculture, from farmer’s seed to people’s food,” said Dr. Christoph Then, Patent Expert of Greenpeace Germany. “In reaction to Greenpeace opposition to the wheat patent, Monsanto officials in India have claimed that the company is out of the cereal business in Europe and the patent therefore is of no consequence. If this is so, they need to immediately withdraw the patent. We urge Monsanto to stop these attempts of bio piracy. Farmers in India are deeply outraged and feel cheated. These varieties are developed by our farmers after years of hard field work and it is high time that Government of India woke up and took action” said Krishan Bir Chaudhary of Bharat Krishak Samaj. By challenging this patent on traditional Indian wheat, Greenpeace is throwing a larger challenge to the monopolistic patent system that operates in Europe, which allows for life forms to be patented. or Divya Raghunandan, GE Campaigner at draghuna@dialb.greenpeace.org or at +91 98455 35406.
necessary to enable the further, harmonious development of case law in this field. harmonising the practice of patent offices within Europe. law regarding the patentability of computer programs according to the EPC. computer when the program is executed. phone or an embedded processor). intended to be methods which can be implemented wholly by computer. routinely included in patent applications in the field of computer technology. - computer program products, storing a computer program. programs for computers as such. In practice they rejected nearly all such claims. for carrying out the method were found to be allowable by the Examining Division. taken into consideration and found not to preclude the patenting of computer programs. computers as set out in the EPC. computer programs which were not in this subset were not excluded from patentability. used in the common computer commands ‘cut’, ‘copy’ and ‘paste’. excluded (irrespective of the nature of the method x). performed by a computer program while executed by conventional hardware. as a computer program product. OR STORE A COMPUTER PROGRAM? exactly features can confer technical character to such claims. executed by a computer it must be stored on a computer-readable data storage medium. patentable when it has technical character (Reasons, 5.3). hardware) of the instructions given by the computer program. (Reasons, 5.1, 2nd paragraph) and T 1284/047 (Reasons, 2). method. This was also the view given in T 38/868 (Reasons, 14). Regarding T 1173/97, in its analysis of TRIPS (Reasons 2.3) the Board noted that Art. computers to either a product or a process. physical entities and physical activities. methods and computer programs which will cause a method to be implemented. different standards for deciding on patentability are applied to the same subject-matter. THE TECHNICAL CHARACTER OF THE CLAIM? THAT THE PHYSICAL ENTITY BE AN UNSPECIFIED COMPUTER? ANY PARTICULAR HARDWARE THAT MAY BE USED? hardware that are inside a computer and those that are outside. technical effect on a physical entity. descriptive information about the data object. clearly be seen as technical. control module to adapt the program to work with the modified hardware. independent of the hardware used. particular if the aspects relating to programming are claimed in any detail. program could fall within the exclusion. THE TECHNICAL CHARACTER OF A CLAIM? FURTHER TECHNICAL EFFECT WHEN THE PROGRAM IS EXECUTED? and T 258/03, Reasons, 3.1). clarity concerning the skills attributable to the skilled person. technical implementation … since the computer routines have to work differently”. technical order management method (Reasons, 20 and 21). T 769/9217 (Reasons, 3.7, 5th paragraph) all considered that a programmer’s activity, i.e. decisions consider programming to be a mental act of the programmer. that the computer is being programmed to carry out is non-technical in nature. process which was no different from a mathematical method’. an engineer who would then pass on his (programming) requirements to the programmer? involve any technical details of the particular computer on which the program will run? matter or activities referred to in paragraph 2 ‘as such’ to be excluded from patentability. mentioned in paragraph 2 is to be regarded as an invention. appears to be that this approach does not have a legal basis in the EPC20. apparently resulted in the absence of such a paragraph in TRIPS25. was to be deleted27. This was similar to the negotiations that took place in 197328. Organisation itself is not a member of the WTO and is not a signatory of the agreement. Neef, in Busche/Stoll, TRIPs, Art. 27 Rdn. 33-34, p447 f.
comprised in Article 52(2) EPC is a violation of TRIPS35. conclude that no guidance can be found in the TRIPS agreement. achieve predictable results in the physical world’40. 40 Recommendation for Second Reading, A6-0207/2005 of 21 June 2005, amendments 17 and 19.
fields of technology” in Article 52(1) EPC, paragraph 2 was not amended. down in Article 52(2) EPC, was not defined. computer program is technical or not. previous section to the Enlarged Board of Appeal for its opinion.